Shares stumbled against the market last month as the paint giant reported slowing sales growth. Paint giant Sherwin Williams (NYSE:SHW) lagged the market last month by falling 14% compared to a 7% slump in the S&P 500, according to data provided by S&P Global Market Intelligence. The decline put shares in modestly negative territory for the year, down about 2% compared to a 2% increase in broader indexes. October's drop came after the company announced lackluster third-quarter results while projecting more modest growth ahead. Sales improved by 5% to land at the low end of the forecast that CEO John Morikis and his team had issued in late July. 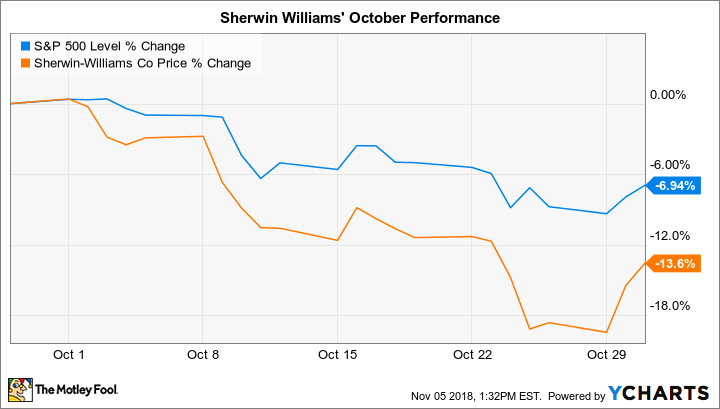 Sherwin-Williams was able to pass along modest price increases, but profitability was still hurt by a spike in supply chain costs. Executives lowered their 2018 earnings outlook to account for the rising expenses. However, investors were a bit more concerned about the growth slowdown that management is projecting due to a slowing housing industry in the United States, plus pockets of weakness in China and Europe. These challenges could keep a lid on sales gains over the next few quarters even as Sherwin-Williams makes further progress strengthening its global business by better integrating the recent Valspar acquisition.